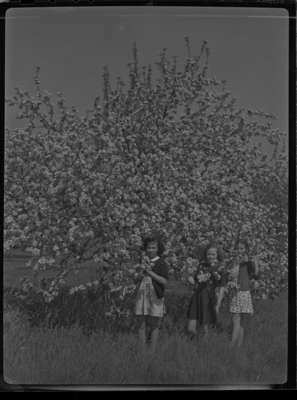 A black and white photograph of three girls standing in front of a blossoming apple tree at Red Wing Orchards in Ajax, Ontario. The three girls are identified as Jane Holliday, Naida Worrel and Shirley Disney. Norman Irwin (1903-1983) was owner and operator of Red Wing Orchards. Red Wing Orchards got its name from Norman Irwin's place which had red wings. Red Wing Orchards was located at Highway 2 and Lakeridge Road at the border between Whitby and Ajax. It is currently Highland Farms, Ajax. Blossoms at Red Wing Orchards, May 23, 1946, Marjorie Ruddy. Whitby Archives A2013_040_1172.